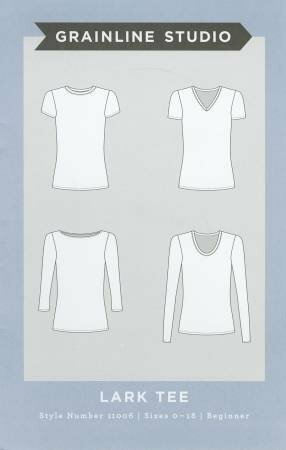 Part of our Garment Foundations series, the Lark Tee will add new dimension to your wardrobe. The Lark Tee is modern and flattering to any shape, great on its own but also perfect to layer with your favorite button up or blazer. The pattern comes with four sleeve length options and interchangeable necklines giving you sixteen options in all! Fabric options: Light to medium weight jersey knits, minimum 20% stretch. Cost: $65 for the (July will be a single day course -- will complete your top on one Saturday, there will be lunch break)two-week course. This course requires a pattern and supplies which will need to be purchased at The French Seam as well. The French Seam provides sewing machines and basic sewing notions to use during the class. We provide sewing machines and basic sewing notions for class use. This class requires that you have taken the Scout Tee Class or have equivalent sewing skills. Class pattern and supplies must be purchased at The French Seam.